Next Year, People Will Spend More Time Online Than They Will Watching TV. Thatâ€™s a First. Itâ€™s happening faster than expected. 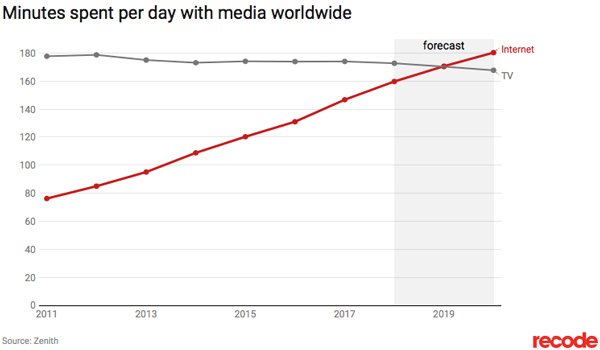 Itâ€™s finally happening: Next year, people around the world will spend more time online than they do watching TV, according to new data from measurement company Zenith. In 2019, people are expected to spend an average of 170.6 minutes each day on online activities like watching videos on YouTube, sharing photos on Facebook and shopping on Amazon. Theyâ€™ll spend slightly less time â€” 170.3 minutes â€”watching TV. Advertisers, for once, are ahead of the curve. Globally, theyâ€™re expected to spend $60 billion more on internet than TV advertising in 2019. Lower-priced smartphones have accelerated internet adoption by quickly bringing the developing world online. 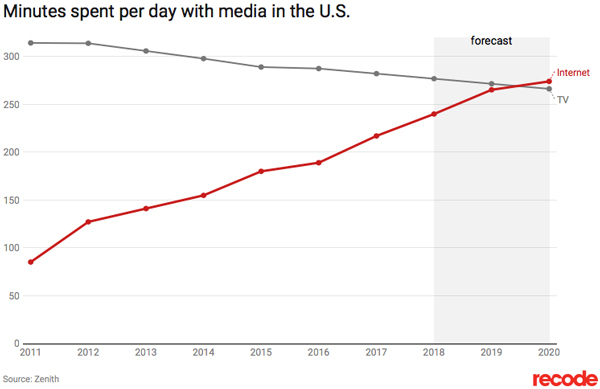 Mobile will be responsible for all growth in internet consumption and more than a quarter of all media consumption â€” that includes time spent watching movies in theaters, listening to the radio and reading physical newspapers and magazines â€” next year. The total time we spend on media activities is still growing as more offline activities (talking with friends in person) become online activities (chatting on social media). Altogether itâ€™s expected to grow to 486.5 minutes per day next year, up from 479 this year. Copyright 2018 Vox Media, Inc. All rights reserved. From https://www.recode.net.